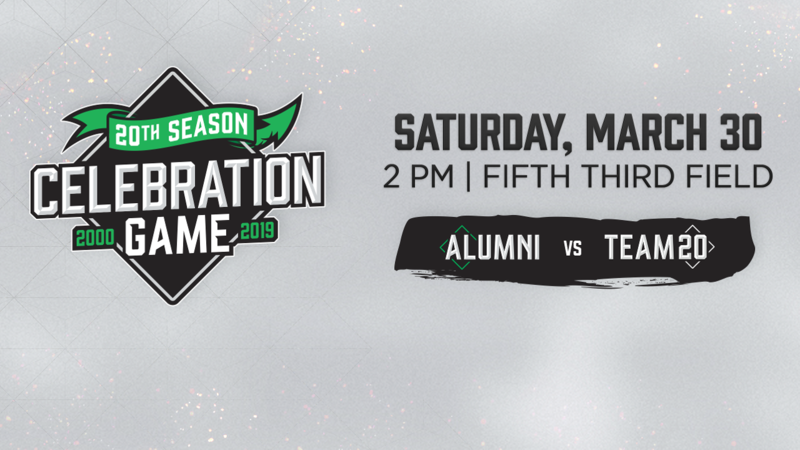 Dayton, Ohio-As a kick-off to their 20th season of operation, the Dayton Dragons will host a special, first-of-its-kind game at Fifth Third Field. The "Dayton Dragons 20th Season Celebration Game" will take place on Saturday, March 30 at 2:00 p.m. The game will match the 2019 Dragons ("Team 20") against a team of Dragons alumni who are still playing in the Cincinnati Reds minor league system. The Dragons Alumni team will include many of the biggest names to play in Dayton over the last several seasons. The full Alumni Team roster will be announced at a future date, but the Reds have identified five former Dragons who are expected to participate. They are outfielder Taylor Trammell, catcher Tyler Stephenson, infielder Jonathan India, outfielder T.J. Friedl, and catcher Chris Okey. Players on both teams will wear specially designed uniforms. These game-worn jerseys will be autographed after the game and will be available for a post-game on-line auction. Every fan attending the game will receive a Dragons commemorative 20th season print. Dragons President Robert Murphy, who has overseen the organization since its inception, says the event will commemorate the milestone season. "This game is a tribute to the incredible memories at Fifth Third Field, and to our fans and sponsors as we head into our 20th season. The Dragons rich history includes an amazing collection of moments. There have been exciting record-breaking achievements, great players, and heartfelt stories within our community. It has been a tremendous success story that we are proud to continue forward. We extend our thanks for the Cincinnati Reds organization for making this game possible." The Dragons history is headlined by the team's all-time record sell-out streak that is still active at 1,316 consecutive dates. Over the Dragons history, more than 11 million fans have attended games, placing the franchise at the top of the attendance rankings for Single-A Minor League Baseball for each of their first 19 seasons. The Dragons have hosted two Midwest League All-Star Games, three exhibition games featuring the Cincinnati Reds, and have seen 97 Dragons players reach the Major Leagues. The Dragons will officially open their 20th season in the Midwest League with their Opening Night game on Thursday, April 4 against the Bowling Green Hot Rods. Ticket information for the Dragons 20th Season Celebration Game: Dragons season ticket holders are receiving information today via email. All fans can go to www.DaytonDragons.com/CelebrationGame for more ticket information and to add their name to the ticket waitlist. Single-game ticket sales will begin in mid-February.